Here are a few flyers of shows we have staged over the years, some of them have links to a show page where you can view some photographs of the show. Singin’ in the Rain was one of the most technically challenging shows that SMYCMS have attempted, as it involves that famous dancing and singing in the rain scene, which consists of a special water truck on stage to recreate the rainfall. In 2005 Annie Get Your Gun was given the SMYCMS treatment with this updated version of the old classic tale of rootin’ tootin’ shootin’ Annie Oakley. 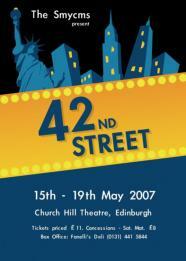 The Smycms Show of 2007 was 42nd Street, based on the Warner Bros. film of 1934, it first opened as a stage show on Broadway in 1980, packed full of great songs by Harry Warren and Al Dubin it tells the story of a small town girl who makes good, proof that any one can live the American Dream. The show for 2004 was My Fair Lady, a Lerner and Loewe classic with such everlasting songs as, Wouldn’t It Be Lovely, I Could Have Danced All Night and Get Me To The Church. 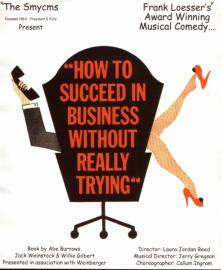 2001 was the year for How To Succeed.. which was quite a demanding show as there are so many scene changes. 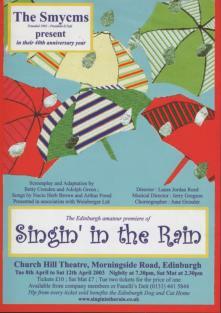 This was our second time around for Guys and Dolls in 2006, but it was staged at the George Square Theatre, as our usual venue the Church Hill theatre was being refurbished. VARIOUS: A selection of scenes from other shows that Smycms have staged over the years.